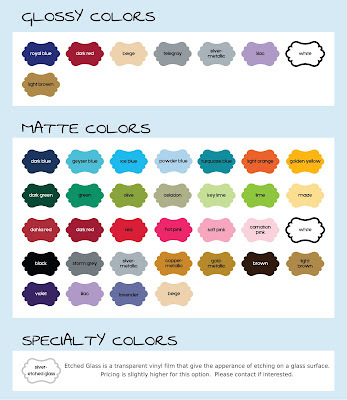 Here are the current color choices you have to choose from when ordering your vinyl. Vinyl comes in a matte or glossy finish. All vinyl is the same price, excluding the Silver- Etched Glass (coarse). Please contact me for pricing with this vinyl, it is estimated about 3 times more than than the others.